Elephant herds live in a group as a family, with one matriarch in charge and other matriarchs as valued role models. Elephants are role models even for humanity; African tribes, recognizing and honoring the emotional characteristics of elephants pass legends of mythical elephants with special powers from generation to generation. Observations of elephants’ intelligence and compassion are part of tribal life. Elephants have been observed exhibiting love, compassion, grief and trauma. A baby elephant receives love from the moment he's born. Female members of the herd attend the laboring mother and immediately start bonding with the calf. The young calf is considered the responsibility of the whole group. He spends his first few years being snuggled, caressed and guided by the cows. If the calf is in danger, the mother will risk her own life to save her baby. Elephant cows have been observed by field scientists risking their lives to save a calf that isn’t their own. If a mother dies, another cow adopts and nurtures the baby. Elderly female elephants are closely involved with babies until they reach their teen years, when they no longer need supervision. Matriarch elephants have even been observed babysitting while mothers graze. In an elephant herd, some members may not be as strong or as healthy as others, but everyone is part of the family, without exception. Sick or injured elephants are surrounded by the others and encouraged to stand, for instance. Elephants use their trunks to massage the weak elephant's shoulders and head. They also use their trunks to prod sick elephants to their feet, and will attempt to use their bodies to support that of an injured or sick elephant. When traveling, healthy elephants often turn and look back at their slower herd mates, stopping and waiting for those elephants to catch up before continuing to move forward. Field scientists have long observed that elephants undertake grief and mourning rituals when a herd member dies. Mother elephants will stay with the corpse of a dead calf for days; the death of a matriarch is cause for long-term mourning. Scientists Cynthia Moss and Harvey Croze, while studying a group of elephants for several years, observed the herd during several mourning rituals after one of the matriarchs in the herd died. Then, years later, the herd revisited the matriarch’s bones. The elephants gathered around the bones, stroking them with their trunks. The elephants parted to allow the daughters of the dead elephant to approach the bones. The two female elephants spent hours with the bones of their mother, putting their trunks on her jawbone and caressing her skull. Elephants suffer from trauma not unlike humans do. 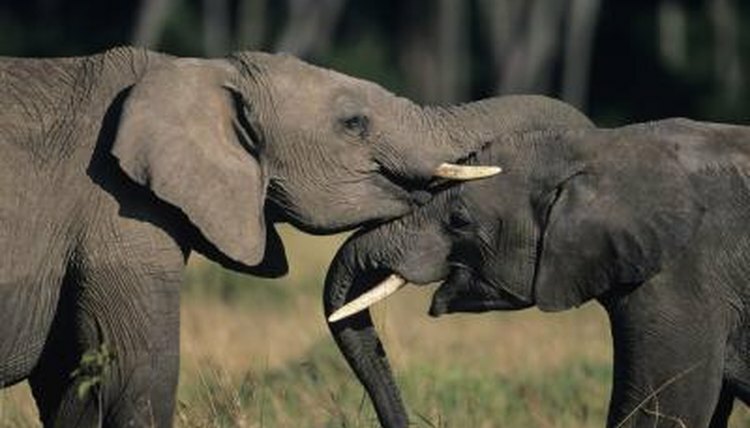 Poaching episodes are violent; they often separate young elephants from their herds. The David Sheldrick Wildlife Trust in Nairobi works with baby elephants who are found wandering alone, starving and dehydrated. The young rescued elephants exhibit symptoms of post traumatic stress disorder, refusing to play or eat and unresponsive to other elephants’ attempts at socialization. Even after arriving at the sanctuary, they may spend days looking for their family members and are often observed crying. Keepers must work carefully with new charges to ensure their psychological needs are met so that later they can be integrated into a wild herd.